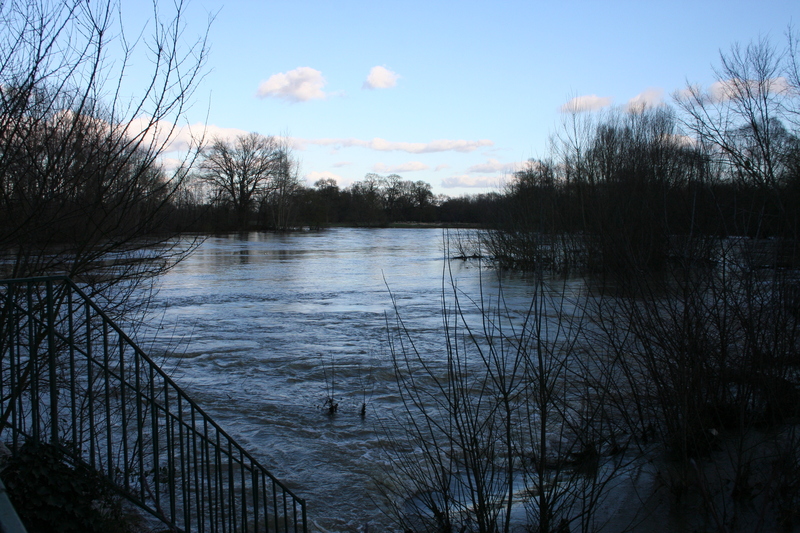 Its been wet, very wet, and the River Cher is as high as it can safely be. 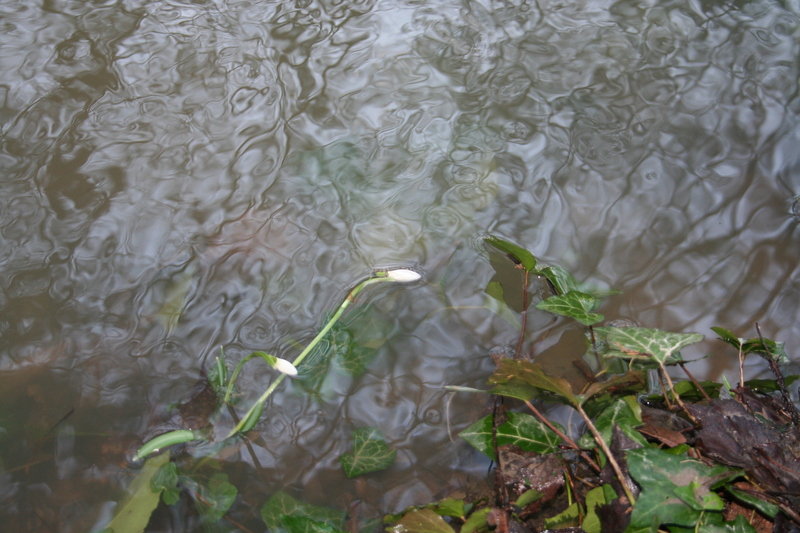 We walked the dog out to the old mill to see what the flooding looked like and to admire the Snowdrops. It’s not Spring ‘til the old lady says so. I have been consulting the old folks in the village; “I’ve never seen the river so high”, I tell them. 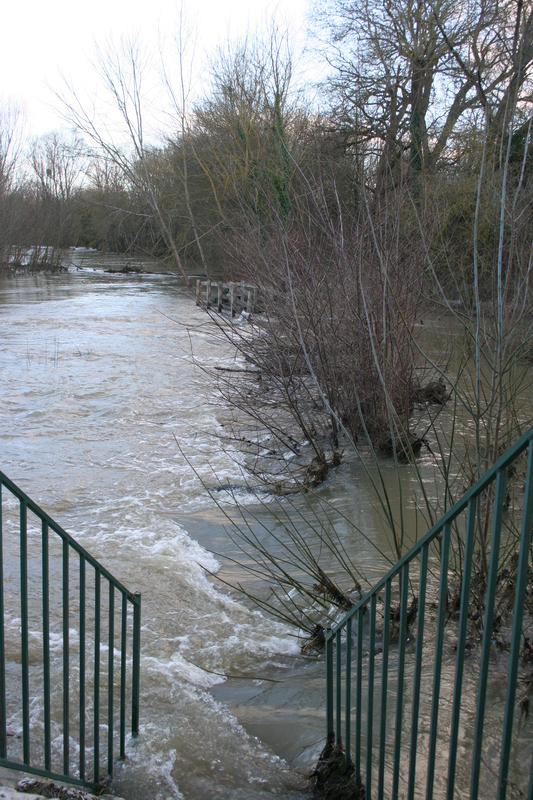 “The last flood was in February 2002”, they inform me, and go on to recount the tales of the River Cher flooding the park and all the houses on the low ground, regularly sealing the town off from the civilised world for a week or more. At the moment it is 45cm from ground level at the Ganguette, where they hold the weekly dances throughout the summer: I’ve measured it. Huge logs float down-stream in the churning, muddy waters and areas where we would normally walk the dog are impassable. We’ve had plenty of rain, but it’s the mountains to the south which are providing much of the flood waters and at the moment they are still rising. 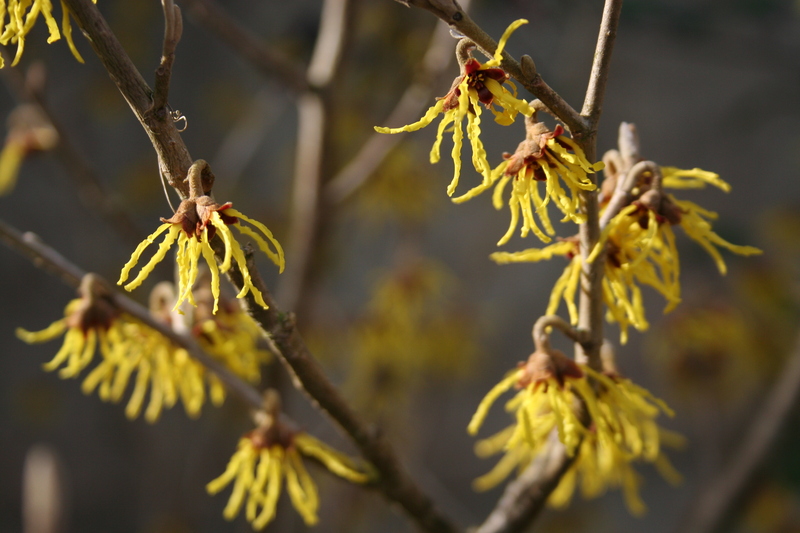 Hamamelis is a winter-flowering shrub, commonly known as witch hazel. Flowering in our garden now in Chabris, central France. I have been able and prepared to do a little work outside in January and February in an attempt to stop the gardening tasks piling up and overwhelming me later in the spring, but I am under no illusions – it’s not Spring until the old folks say so. I am champing at the bit to get a new lawn sown but it is far too cold and wet for that. I have an area of sloping ground near the swimming pool to level, a raised vegetable bed to construct and a security gate to fix. All are on hold for the time being. Pruning and weeding has started and I am pleased with the progress I have made in tidying the place up. Upstairs in the loft, in a Heath-Robinson propagation unit I have installed under the skylights, I already have my first batches of bedding plant seedlings up and soon ready to prick out. The poor weather and the cultivated space that will eventually become a lawn, both conspire to prevent me looking around the garden as often as I would wish but plants are growing and on my last hunt I discovered Snowdrops, Heathers, Hellebores and Witch-hazel in flower. It’s always a good idea to site winter flowering plants close to the house, so that they can be seen when it is inclement. I tell you this and it is a perfectly reasonable statement to make, but of course, in a perverse gardener’s logic, I place them away from the house to encourage me to search them out whatever the weather conditions. Although work for the Garden Design Academy and our many and various web sites keep me busy enough, I am using the quiet time of the year to get to know my fellow French gardeners. Having joined the APJRC, an association made up mainly of chateaux owners who open their gardens to the public, I am attending monthly tutorials led by the “names” of the French gardening world, who are teaching the rest of us the secrets of their art. Last month the lecture was given by a garden designer famous for her traditional and very formal chateaux gardens, Alix de Saint Venant, owner of the château de Valmer. I found her to be extremely competent and an excellent communicator, who discussed the design of large geometric gardens, making a number of interesting points about form, shape and perspective. She also talked about the choice of plants, trees in particular, when your vision of a garden includes the features the grandchildren will have to deal with when they, in their turn, take over the property. It is very different world view to that of the majority of my clients, who want a garden to look good immediately and may well have moved on in ten years’ time. 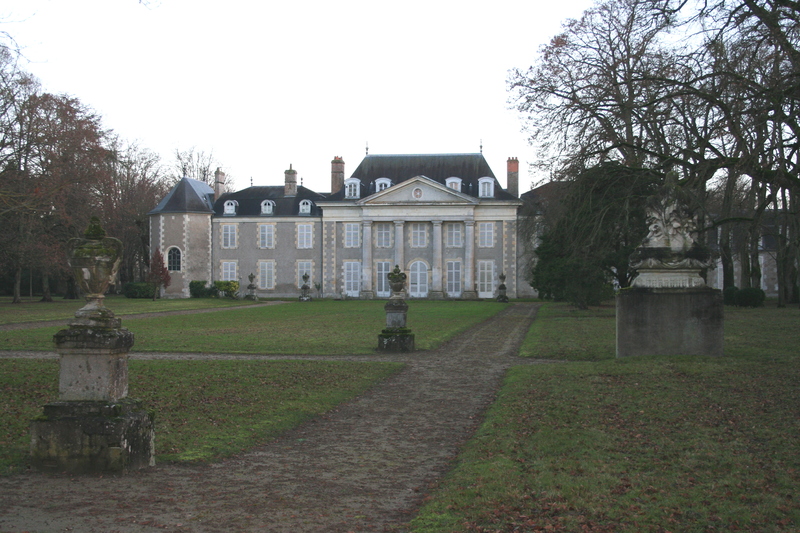 The lecture was held around the ancient dining room table and in the park of the Château de Chevilly and was punctuated by a series of interruptions from journalists and local dignitaries, eager to catch a glimpse of the famous lady. I enjoyed the lecture, the tour and the mid-day meal enormously and was delighted to talk gardening in French with the group. Eager for more, I have signed up for the next session at the Jardins des MétamorphOZes, where Patrick Genty, the former head gardener of Chaumont-sur-Loire, will be talking to us about the use of natural and “alternative” materials for garden structures and getting us out into the garden to harvest material and assemble some. Having a sculptural project in mind for one of our Sequoias, I am keen to hear more. We have been asked to bring seceteurs and a number of other tools but my Felco’s have disappeared; having owned that pair since 1990, I’m very upset. 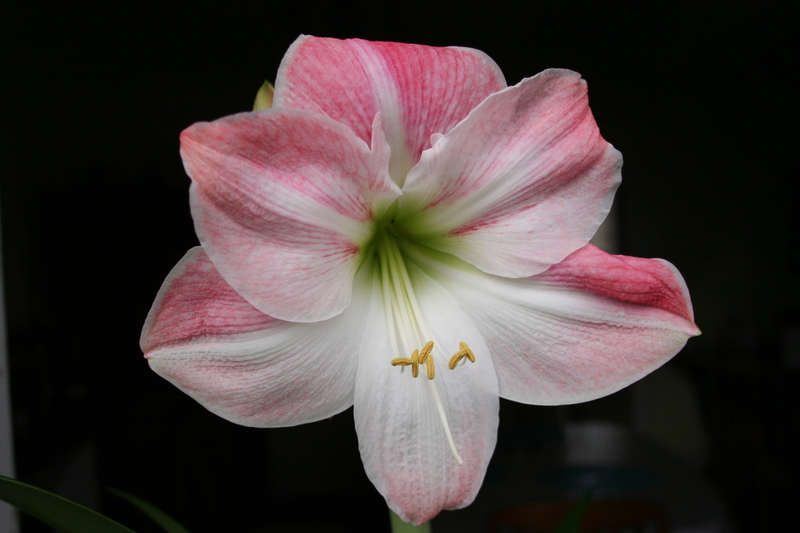 The big joy of our gardening life at the moment is our Amaryllis (Hippeastrum), which we have been watching come into growth and bloom since December. Fantastic flowers are produced from a large bulb which we had earlier allowed a dormant period in the garden shed. Four huge, translucent and lightly perfumed blooms sit on the top of a thick flower stem, two foot tall if it is a day. It makes quite a sight on our dining room windowsill where it seems very at home in light but cool conditions. It’s a south american plant of 90 species (I’d always thought it was south african, but that’s just the bulb Amaryllis belladonna) which the Dutch have been hybrizing since the 18thC. Just two weeks ago I made the Snowdrop our Plant of the Week on Pinterest and noted that new varieties can fetch very high prices. Hot off the press comes news that yesterday, after a bidding frenzy involving 30 enthusiasts, Thompson & Morgan, the Ipswich based mail order plant and seed company, acquired the world’s most expensive snowdrop, Galanthus woronowii ‘Elizabeth Harrison’ for £725. This is a unique and striking variety with a golden yellow ovary and yellow petal markings. The price is almost double the previous world record price for a single rare bulb of Galanthus ‘Green Tear’ sold for £360 last year. Thompson & Morgan hopes to be able to reproduce this variety but Galanthus are notorious for their slow rates of multiplication. They hope to be able to produce it in large numbers by tissue culture, as they did when they purchased the world’s first Black Hyacinth ‘Midnight Mystique’ in 1998 for £50,000 a bulb. It took 15 years before it was available to the general public and since that time demand has always outstripped stock. Last year T&M sold over 1 million snowdrops; the stunning snowdrop Galanthus woronowii ‘Elizabeth Harrison’ was named after the owner of the garden where it first appeared as a unique seedling in a Scotland a few years ago. Such an exciting time of the year this; every day when we tour the garden or are out and about with the dog, there are signs of movement in the gardens and countryside. Our own young garden is now alive with Crocus and Snowdrops, while many other bulbs are pushing their shoots up out of the ground. 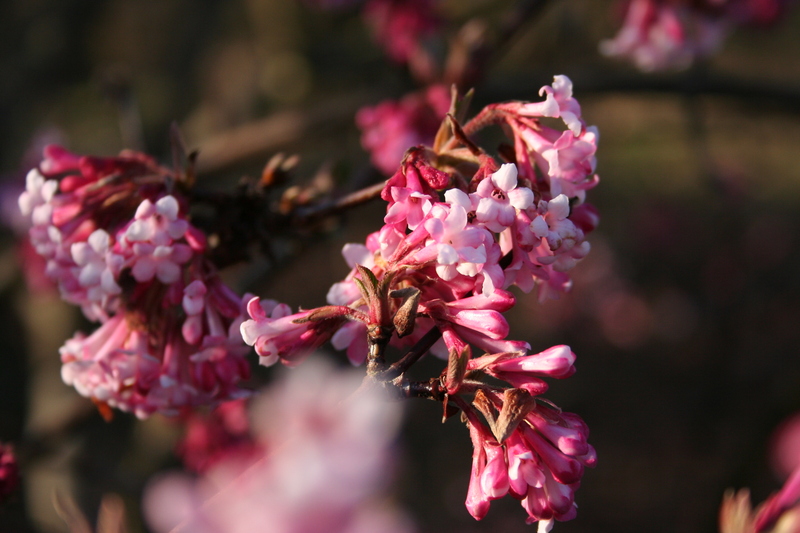 Shrubs and herbacious plants are starting into growth and there are a few buds and blossoms here and there. 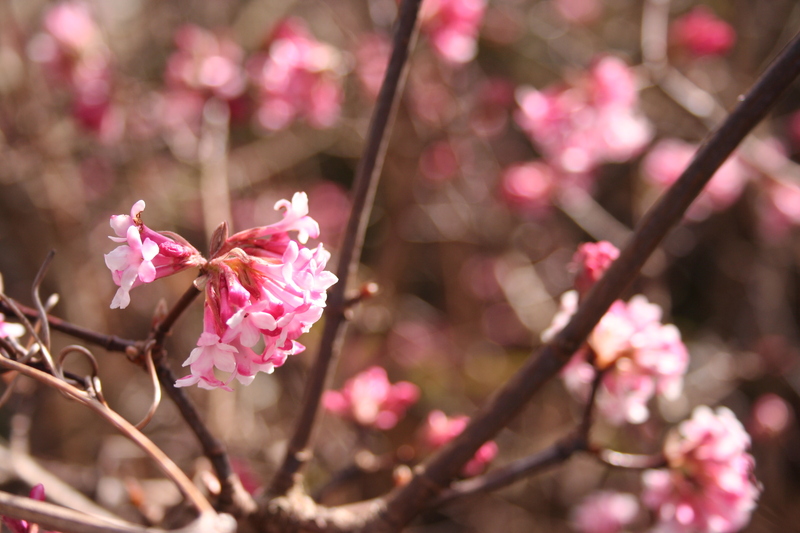 Viburnum x bodnantense. A dark form grown in a few Chabris gardens. We certainly do not have enough winter and spring flowering plants in the garden but the construction of a front wall has opened up many more planting opportunities and I am sure this will be corrected in time. I have my eyes on a lovely dark form of Viburnum x bodnatense, scented, of course, growing in three or four locations around the village. The flowers aredeeper than I am used to but perhaps it’s Dawn or perhaps a French variety. If anyone knows I’d be pleased to hear about it. One of the local specimens has a good sucker or layer just waiting for a new home! 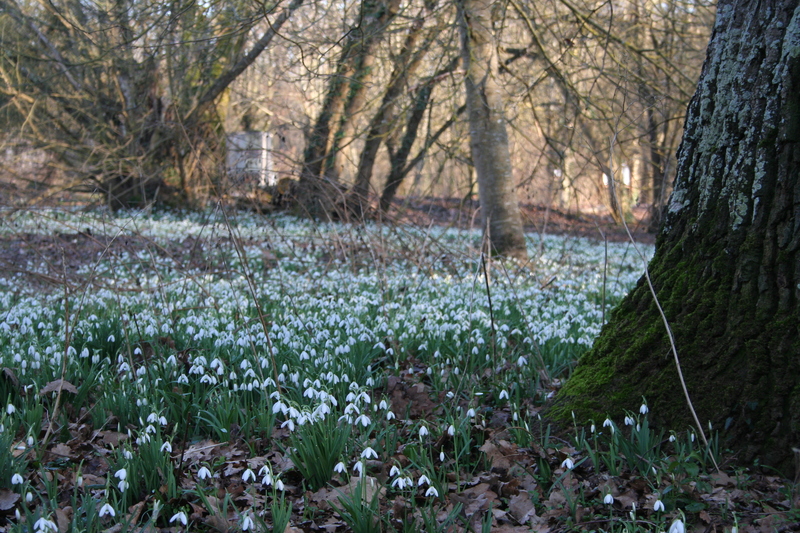 Our Snowdrops are charming but nothing can compare to the sight of them growing under trees in large quantities. The local mill, now beautifully restored and used for sculpture, painting and other art courses, has hundreds of thousands of them in flower at the moment. 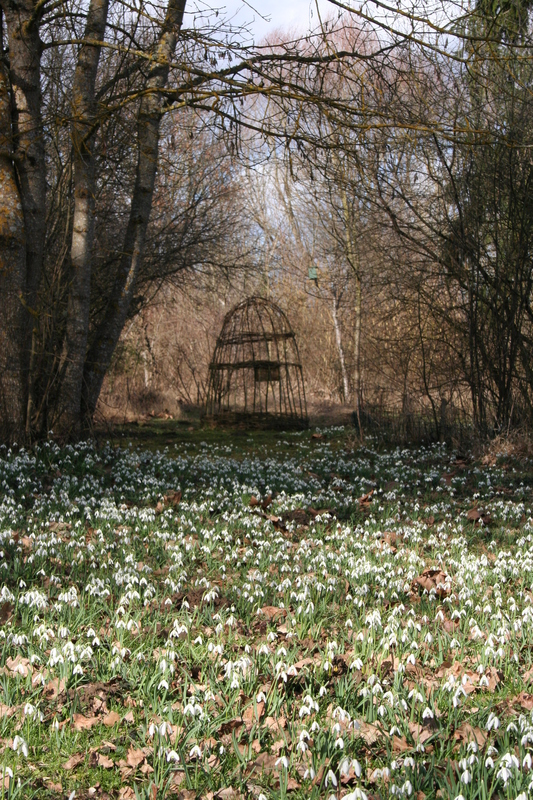 I keep recieving emails from English gardens inviting me to see the Snowdrops and the NGS web site lists many more open to the public at this time of the year. Worth a trip out, I would have thought. Scent and Spring seem to go together as the few flowering plants compete for the available pollenating insects. 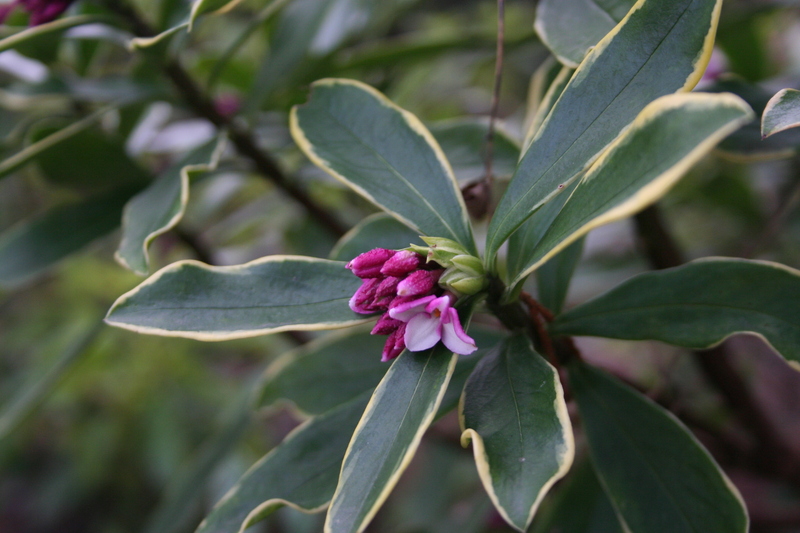 Our new Daphne odora Aureomarginata was planted by the door to the log cabin classroom and is just starting to give off its perfume, a reward for making it to the end of the garden on a grey day like today. I was in the classroom this morning, having lugged the big HP plotter down from the attic to be available for students to print out their work later in the season. There is another to bring down and install once my back has recovered from lifting the first one. The completion of the log cabin, the new front wall and the approaching spring have all encouraged me to get serious about the garden once more. I am discovering however, that I am not as young as I once was and the work, some of it very physical, is having to be spaced out across the week. Between student marking, updating the Academy web site, creating a new site on French gardens and a fair bit of home DIY, I am digging beds, moving plants and planting. Cracking out an old concrete path edge and drain has given me impressive blisters but who knows, if it doesn’t kill me I might find I get fit. “Everything in moderation” as French TV adverts like to say when warning us about the evils of alcohol. Personally, I could do with a decent drink after an exhausting afternoon digging, and France is the ideal place to be if you like a tiple in the evening. Happy gardening, but take it gently and I’ll try to do the same. The mild weather has got central France moving; in back gardens and allotments throughout our region gardeners are stirring from their winter hibernation. Frames and tunnels are breaking out all over and the national sport of shrub pruning has been resumed with enthusiasm. We are far from immune, urging the season on so we can get out and garden, smell the flowers and revert back to the outdoor life we love. I have been creating new beds, cutting a new line into a weedy gravel patio to create more, and more interesting, planting opportunities. I’m quite excited about this new shape, which reconciles the formal house with an original 1890’s water feature we have converted into a flower bed and dining island. A few plants can then be moved and a bed I was never quite at home with will be transformed into something far more appealing. There are signs of live everywhere in the garden, but few plants flowering as yet. 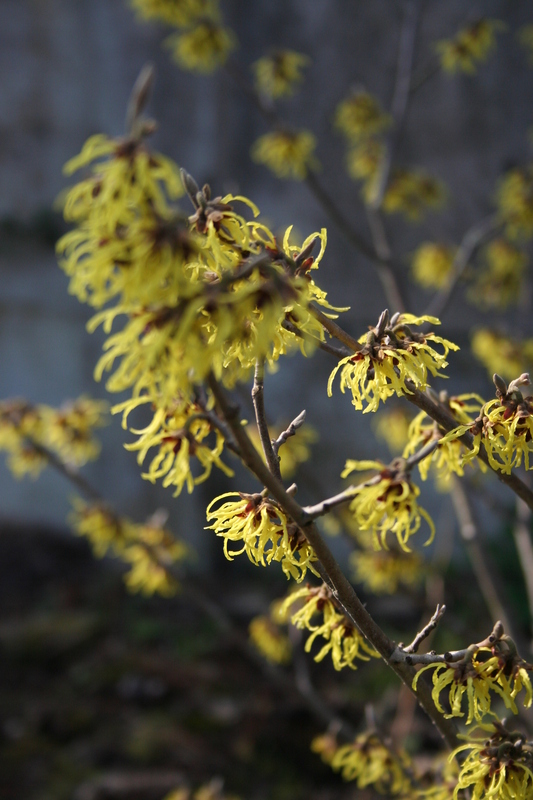 Our Hamamelis is a joy and around the village crocus, Camellia, and Primroses are appearing. 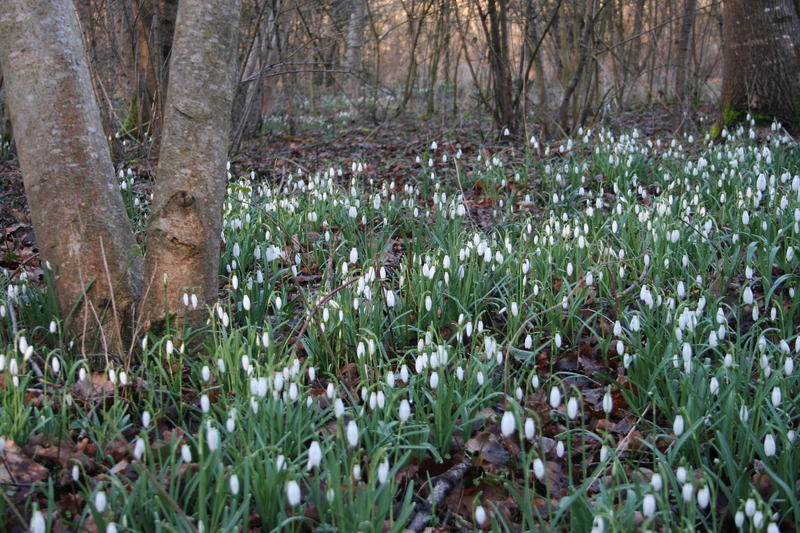 Snowdrops are in full flower, having popped up a couple of weeks ago only to be promptly buried in snow. The weather is very up and down. In the course of a week we have had mild spring-like days and gentle rain, clear frosty nights and mornings and then, this weekend, one of the worst storms for decades hit the west coast of France, turning the Vendee and Charente Maritime coasts into disaster zones. We had plenty of wind here, but short of few trees and a handful of roofing tiles down the town had no great problems. Someone’s polythene greenhouse flew in overnight, ending up in a flower bed, ruining our tree Peony. We hardly slept, listening to the storm battering our Sequoia and ripping the polythene sheeting off the stack of wood in the front garden. The postman has delivered our “publicity”, a post-box full of brochures from DIY chains, supermarkets and gardening stores offering plants, equipment and accessories for the garden. Specialist mail order nurseries over here, as in the UK, produce catalogues featuring plants of unlikely colours and descriptions making the most ordinary variety sound like the crown jewels. The flowers are bigger and the fruits juicier than any normal plant but amongst the hype and nonsense there are some interesting plants. 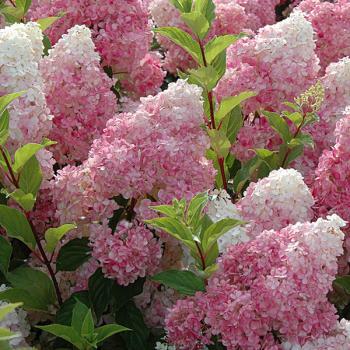 Jacques Briant is offering a delicious new Hydrangea paniculata variety called Vanille Fraise at 10 Euros a pot. At 1.25 Euro our local hypermarket offers stainless steel stakes in a spiral shape for supporting tomato plants, something I promised myself after watching early fruits suffer in the damp last year. The other item I have my eyes peeled for is solar powered garden lighting: I am hoping to rig up something to use with our Japanese granite lantern but have yet to find the solution I am looking for. Also hard to find is lawn edging: amazing but true. The new edge to our patio needs edging and the least complicated and cheapest solution is plastic lawn edging. We have been searching high and low and the best we can come up with is to order it from the UK. Delivery costs will no doubt double the price. Our ideal solution would be to use planks of Robinia – basically a weed around here but excellent rot restistance, better even than Oak. We would need to cut lines into the wood to enable us to create the curves we have designed but hope we can find someoen to lend us a bench saw to do so. We are having difficulty finding these too and continue to research both on the internet. In the mean time the news is full of the disaster in the west of France, with sixty people drowned, thousands of homes damaged, the oyster industry laid waste and 10% of the farming land inundated with sea water. Just a touch of frost this morning, but what a gorgeous day followed. After working on a clients plan for a few hours I needed little excuse to get out and enjoy the sunshine. 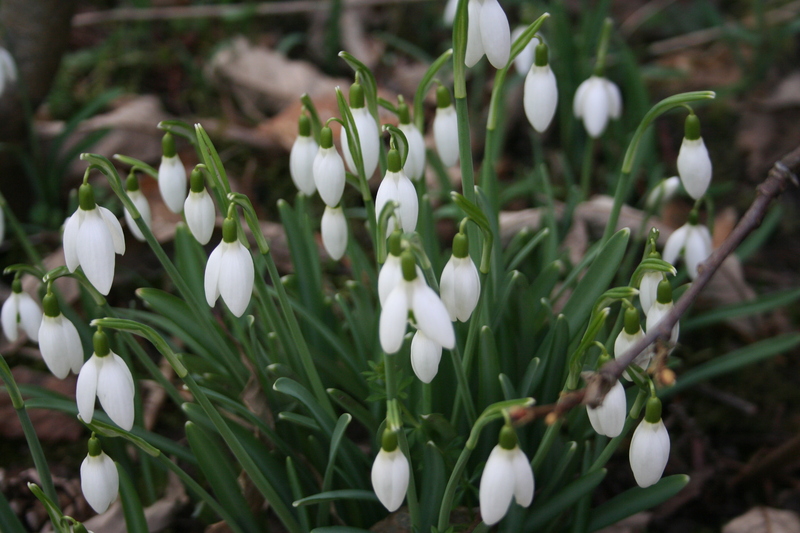 Walking the dog by the river, watching the swans feeding and socialising, we eventually reached the old mill, where Snowdrops – Perce-Neige – Galanthus nivalis – were flowering in huge drifts on a shady lawn. A liitle more work done on the computor and we were out again, our excuse this time the need to do some planting in the little garden we have set aside for our ‘gite’ guests. We dug the soil (dreadful stuff dumped there by builders) and planted a little composition in the sunniest corner: Cupressus Goldcrest at the back, Weigela florida nana variegata to one side, an un-named yellow Cytisus to the other and a clump of purple Heuchera in the middle. All the plants came from an English nursery; we find them to be cheaper and better than over here in France. We are also disappointed to discover that when we do bite the bullet and buy French plants they will not replace any losses you might have in the way that we have come to expect in the UK. We recently informed a French nursery by email that we had lost one of their plants over the winter. His reply was rapid and unequivical: it was not his problem. We were nursery hunting last week, when we visited a huge trade show in Angers, Salon du Vegetal. There were nurseries, equipment suppliers and other horticultural specialists exhibiting from all over Europe, but very few flying the British flag. This is a pity, given the oportunities over here, especially with the pound so low against the Euro. The company you see everywhere is David Austin Roses and again they were on hand with French speaking sales staff and apparently doing good business.